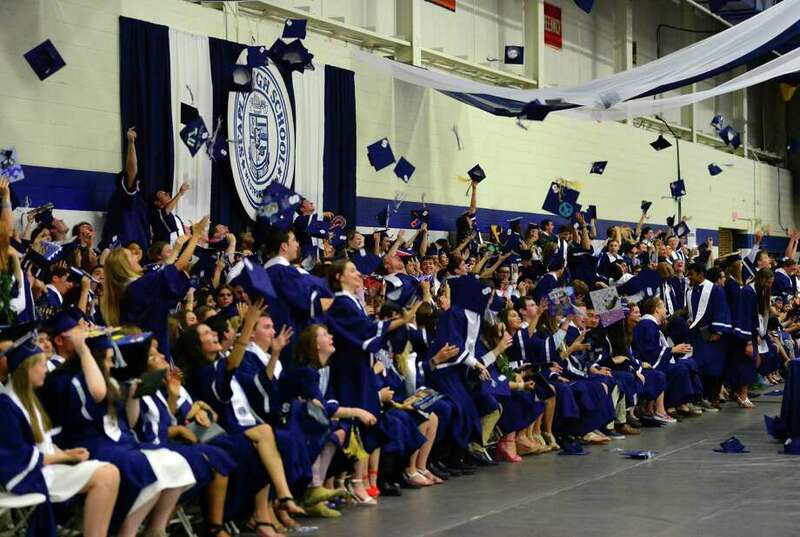 Graduates toss up their mortar board caps to celebrate during Staples High School's Class of 2016 129th Annual Commencement Exercises in Westport, Conn., on Friday June 17, 2016. Another summer is (nearly) over. Next Thursday, a few thousand Westport boys and girls begin a new grade. Some head to a new school. Like a bazillion students before them, among the most excited — and nervous — will be those entering Staples High School for the first time. They’ll walk through the door having been prepared well. They’ve seen it on middle school visits. Many have been there for concerts, shows and athletic events. Administrators have created a strong, embracing welcome-to-high school program. Yet, Staples is still unknown. Incoming freshmen worry how they’ll find their way around. They fret about who they’ll sit with at lunch. And there’s that nagging urban legend about ninth-graders getting stuffed into lockers. But freshmen are not the only folks thinking about Staples. Every summer, alumni return for reunions. Many are eager to see their old school. For most, it no longer exists. The Staples they attended was a one-story building, demolished now for over a decade. Some remember when the school was nine separate structures, connected only by California-style walkways. For a few reuniongoers, Staples was located on Riverside Avenue, where Saugatuck Elementary School now sits. Somehow, I’ve become the go-to tour guide for reunion classes. A few times each summer, groups of 20, 40, or even 60 alumni gather on North Avenue. They may have graduated 20, 40, or even 60 years ago. But they want to see the new school that replaced the old one they loved. I’m happy to show them all of it. We start at the main entrance. That itself is novel: The previous incarnation of Staples had no front door. Remembering a school without a defined entry makes alums smile. Seeing a security desk inside the entrance makes them realize that 2016 is not 1996, 1976 or 1966. We pause at the school seal, a dramatic focal point of the new school. Then, we’re off. We head up to the second floor, where we stand on the “bridge” that was envisioned as a simple passageway, yet has become a student hangout. I say it’s a great place to collaborate on class projects, in part because of the excellent Wi-Fi reception. That leads to a discussion of the new model of education: It’s not just about teachers lecturing as kids take notes. A quick look at two journalism classrooms — where students produce not just a print version of the school paper, but also a very popular online one — helps even relatively young alumni realize how much school life has changed. At the world language labs — once known as foreign language — I describe Staples’ many offerings: Spanish, French, German, Italian, Latin and Mandarin. I talk about exchange programs with China and Singapore. Alums respond by reciting ridiculous stuck-in-their-brains dialogue from old ALM records. One floor up, the horticulture greenhouse gives me a chance to describe Staples’ robust science offerings. I talk about popular courses like environmental studies (an Advanced Placement subject), and the Authentic Science Research curriculum. As I point out the math rooms, I mention the huge push Staples has made to hire female teachers in math and science. These women are tremendous role models for girls — and boys. Back on the first floor, we enter the playschool classroom, for child study and child development classes. Alums love to hear little kids are a presence at Staples, and that high school students are learning more than just math and science during the school day. The art wing is familiar territory (though computer graphics courses are new to the grads). I make sure to take each tour into the choral room. As I describe Staples’ robust music program, alumni realize the memories they made here continue just as strongly today. The Black Box Theater draws “oohs” and “aahs,” especially as I describe some of the shows produced there. But two of the biggest eye-openers lie ahead: the media lab (for TV, radio and audio production) and two professional-grade culinary classrooms. Alumni are sorry to hear Staples’ former metal and auto shops are no more (part of a national trend away from vocational education). They chuckle at the gym that looks unchanged for decades. They gape at the enormous library (and say, “I don’t even remember we had a library!”). The tour ends at the auditorium — once a separate building, now integrated fully into the school. Posters and photos of past shows bring back floods of memories. Alumni leave in awe. They realize their high school is an even more amazing place than it once was. Over the next four years, let’s hope our incoming freshmen feel that same love, too.